Yesterday I told you about how this blog came to be all from a little event called NaNoWriMo. As a writer, Nanowrimo helped me cross that ginormous hurdle called “a completed manuscript.” I had been writing for years, but never finishing anything. That is, until my brother, international bestselling author, Aaron Pogue (He pays me a nickle every time I call him that) introduced me to the fabulousness that is Nanowrimo. A month later I had a finished first draft and the rest is history. As a teacher, I love Nanowrimo because it gives kids a concrete goal and it helps to show them the thousands of aspiring writers from across the globe who all have the same goal they have: to write a book! Nanowrimo’s Young Writer’s Program is amazing! They provide teachers like me with resources to help my group of aspiring young authors reach their goal. Last year I used some of their worksheets and we had a lot of fun learning more about dialogue together. In my opinion, the best practice for learning dialogue is writing a play. In October, my little writing group had a blast writing a few silly plays together as we practiced the important elements of dialogue. We learned how to show action without simply describing it. We practiced how to share sensory information with an audience (ie. “Brrr, it sure is cold in here!) We even threw in a few ridiculous sentences just so that we could laugh as our friends had to read them aloud. Well, imagine my surprise when I visited the Nanowrimo site yesterday and discovered this wonderful announcement: Script Frenzy begins April 1st! That is just under two weeks away, so we better get ready if we’re going to join the fun! 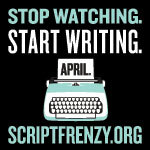 Script Frenzy is another wild adventure brought to you by the same crew who pilot national novel writing month each fall. Only, this time the goal is to write a complete script. It can be a play, a t.v. show, a movie, anything that involves a full story line in script form. What fun! Wait! Did I hear someone say they don’t know how to write a script? No problem! That’s why we’re here, right? We get to learn something new and practice it, too! The young writer’s program over at script frenzy thought there might be a few of us who needed a little help, so they created Script Frenzy Bootcamp. There is one for elementary age students and one for middle school students. They even have a bootcamp designed for highschool. At bootcamp, you’ll find all the help you need to train for the big event. Stretch yourself and your imagination. Practice and prepare a little each day. This is how we get our brain and fingers ready to work together. Before you know it, you’ll have a finished script. So, what are you going to write? I think I’ll start on my next webseries. I’ve been thinking about it for months. I know a sixth grader here who will be working on her own original movie script – something about the Muppets and the story of Peter Pan? What story would you write? Do you have an idea for a movie? A play? A new and fabulous t.v. show? Tell us about it and then go check out Script Frenzy. It’s going to be a blast!